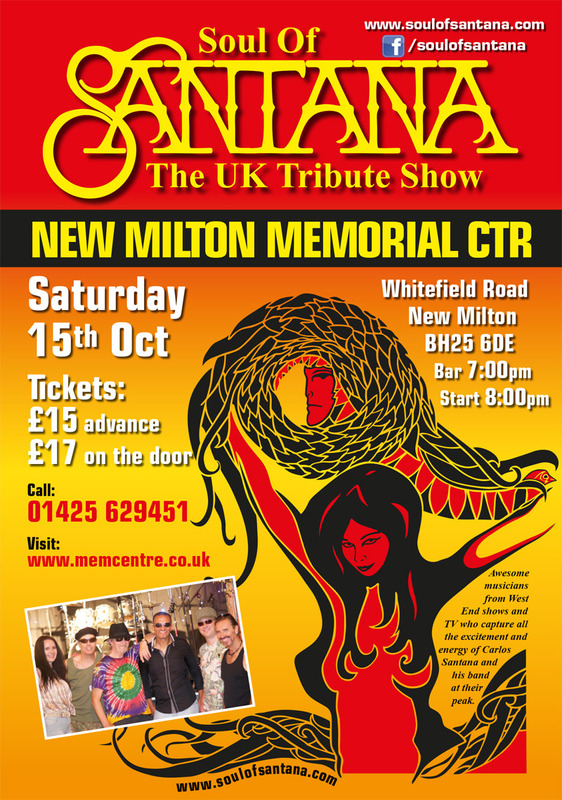 Soul of Santana, the ultimate homage to Carlos Santana and his band, returns to the New Milton Memorial Centre on Saturday 15th October. Encompassing nearly five decade of legendary music and channeling the spirit of Santana and his band at their very best. Rediscover the songs and performances that have ensured Santana’s place as one of the most loved bands of all time. From the exultant heights of such classic hits as ’Smooth’, ‘Evil Ways’, ‘She’s Not There’, and ‘Soul Sacrifice’, to the cathartic relationship autopsies contained on the bestselling Supernatural album. Like previous Soul of Santana concert performances – this guarantees to offer the audience a rich and emotive musical experience, blowing away the cobwebs and rekindling those precious personal memories in a way that only the best music can. From the outset, the Soul of Santana musicians have always striven to combine their deep personal love and reverence for the music of Santana with the excitement and spontaneity of live performance. Immersed in this music as they are, they know that these are songs which simply refuse to be played without passion and intensity. It is now almost half a century since Santana first emerged onto the world stage. Over the intervening five decades it is fair to say that both the band and the world have been through some considerable changes. Throughout it all, however, the music of Santana has retained its place in the hearts and souls of millions of fans the world over. Tickets £15 are available from the theatre box office or online. Tickets also available from Eventbrite.